435 Marlborough is located on the north side of Marlborough, between Massachusetts Avenue and Charlesgate East, with 433 Marlborough to the east and 437 Marlborough to the west. 435 Marlborough was built in 1885 for Chadwick & Stillings, for speculative sale, one of eight contiguous houses (431-445 Marlborough). Chadwick & Stillings (N. Henry Chadwick and Oscar L. Stillings) was a hat block and flange company that became a significant house building firm in the 1880s and 1890s. They are shown as the owners, architects, and builders on the original building permit applications for 431-445 Marlborough, dated June 16, 1885, and on the final building inspection report for 435 Marlborough, dated November 13, 1886. 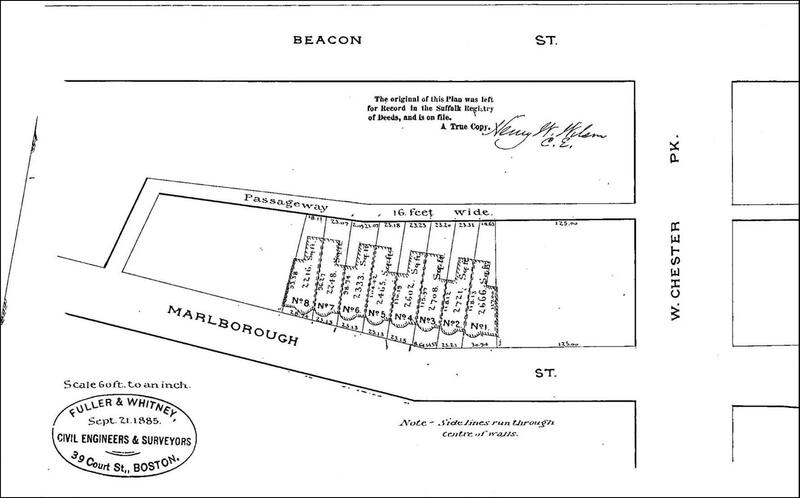 Click here for an index to the deeds for 435 Marlborough, and click here for further information on the land west of Massachusetts Avenue between the south side of Beacon and the north side of Commonwealth. On January 28, 1887, 435 Marlborough was purchased from Henry Whitney by Dr. David Williams Cheever, a physician and surgeon. He and his wife, Anna Caroline (Nichols) Cheever, lived at 239 Boylston (renumbered 557 Boylston ca. 1890). By the 1887-1888 winter season, 435 Marlborough was the home of Charles Sumner Eaton and his wife, Ella F. (Thompson) Eaton, who leased the house from David Cheever. They previously had lived at the Hotel Cluny at 233 Boylston (renumbered 543 Boylston ca. 1890). 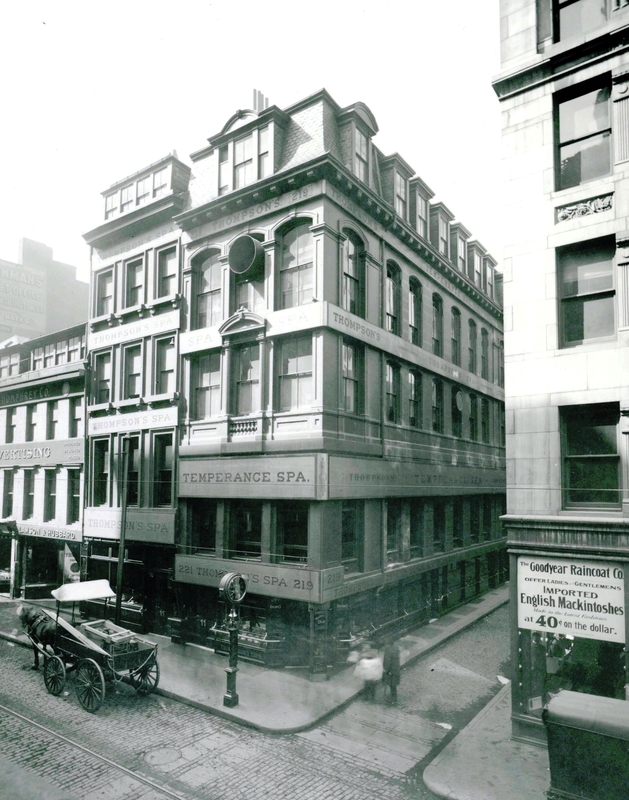 “You will find Mr. Eaton if you will go any day in Boston to the ‘Temperance Spa,’ which is at no. 219 Washington Street. That is the real name on the picturesque sign, but I find people call it in practice the ‘Temperance Bar,’ and I do not see why they should not, for that is exactly what it is. It is nearly opposite the head of State Street, a small, elegant saloon, opening directly from the sidewalk, in the most crowded part of the most crowded street in Boston. I do not suppose I should say I am a habitué there, but I hardly ever pass it on foot in the middle of the day, without going in. I stopped there the other day when forty-four customers were standing as close as they could stand at the different counters, and several more, like myself, were waiting for their turn. I asked Mr. Eaton if he knew how many people had ever passed through the shop in a day, and I found that he did not. There are three entrances and it would be almost impossible to count. But I think it is certain that no other drinking-shop in Washington Street receives so many customers as the day goes by. In about 1900, Charles Eaton renamed his restaurant Thompson’s Spa, named for his wife’s family. 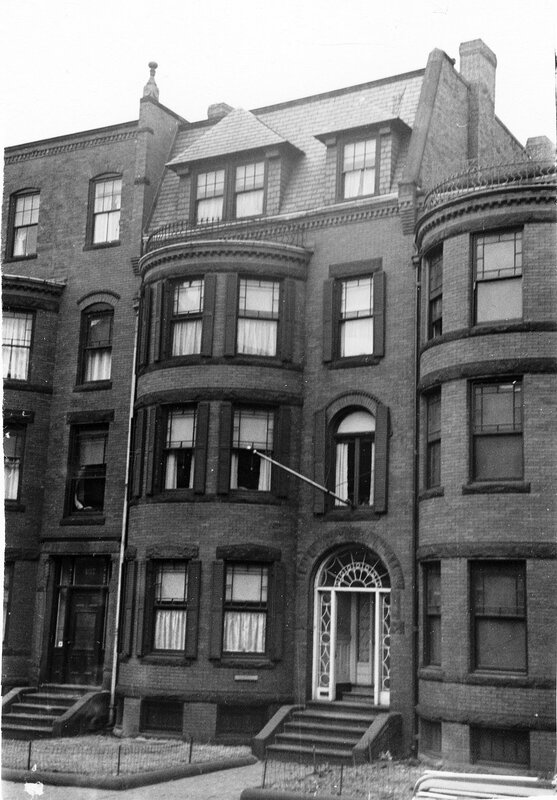 The Eatons continued to live at 435 Marlborough during the 1892-1893 winter season, but moved thereafter to Brookline. 435 Marlborough was not listed in the 1894 Blue Book. On April 25, 1894, 435 Marlborough was purchased from David Cheever by Katharine Kendrick (Wheeler) Swain, the wife of George Fillmore Swain. They previously had lived in an apartment at 409 Marlborough. George Swain was a civil engineer and professor of civil engineering at MIT and then at Harvard’s Graduate School of Applied Science. Katharine Swain died in December of 1901. In her will, she left 433 Marlborough to her husband. George Swain married again in January of 1904 to Mary Hayden Lord. After their marriage, they lived at 435 Marlborough. They also maintained a home in Ipswich. On October 22, 1908, he transferred 435 Marlborough into his wife’s name. Mary Swain died in April of 1914, and George Swain once again inherited 433 Marlborough. George Swain married again, in August of 1914, to Mary A. (Batchelder) Rand, the widow of Frank H. Rand. After their marriage, they lived at 1988 Commonwealth in Brighton. On February 11, 1915, 435 Marlborough was acquired from George Swain by real estate dealer Max Shoolman. 435 Marlborough was not listed in the 1916 Blue Book. On January 14, 1916, 435 Marlborough was acquired from Max Shoolman by attorney Samuel Henry Hudson. He married in February of 1916 to Emilie E. Potter and they made 435 Marlborough their home. 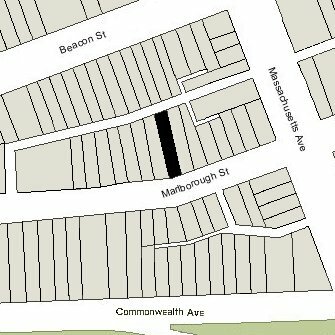 Prior to their marriage, he had lived at 96 Bay State Road and she had lived in an apartment at 423 Marlborough. They continued to live at 435 Marlborough during the 1918-1919 winter season, but moved thereafter to the Hotel Vendôme. On March 26, 1919, 435 Marlborough was acquired from Samuel Hudson by Dr. George Sherwin Clark Badger, He and his wife, Grace M. (Spear) Badger, made it their home. They previously had lived at 48 Hereford. They also maintained a home in Cohasset. George Badger was a physician and maintained his office at 435 Marlborough. During his career, he served as physician in chief of the New England Baptist Hospital, and also was an instructor at Harvard Medical School. On April 17, 1922, he transferred the property into his wife’s name. George Badger died in April of 1954. 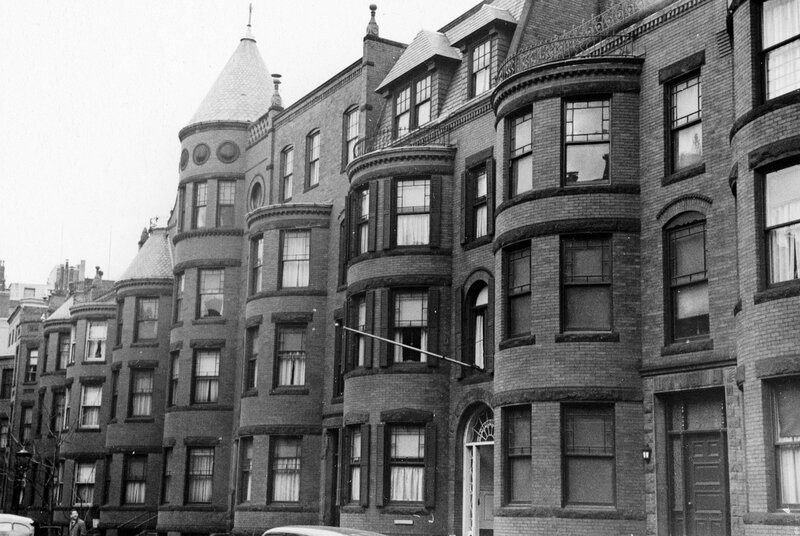 Grace Badger continued to live at 435 Marlborough until about 1958, when she moved to an apartment at 295 Beacon. On August 4, 1958, 435 Marlborough was purchased from Grace Badger by Katherine (Catherine/Kay) (Cullen) Gilgunn, the wife of Philip Gilgunn (Gilgun). They lived at 432 Marlborough, where they operated a lodging house. She was a nurse. In about 1960, the Gilgunns moved to 435 Marlborough, which they listed in the City Directory as “tourist homes.” By about 1963, they had moved back to 432 Marlborough. On April 28, 1962, 435 Marlborough was acquired from Katherine Gilgunn by Franklyn G. Bill and Sidney R. Handler, trustees of the C & S Realty Trust. They continued to operate it as a lodging house. In November of 1965, Franklyn Bill and Sidney Handler acquired 432 Marlborough. On November 24, 1975, 435 Marlborough was purchased from Franklyn Bill and Sidney Handler by Roger E. Cole of Stoneham. In April of 1978, he purchased 432 Marlborough from them. On October 15, 1981, 435 Marlborough was purchased from Roger Cole by Charles C. Patsos, trustee of the 435 Marlborough Street Trust. In 1991, the building was damaged by fire. It remained vacant for the next four years. In August of 1994, Charles Patsos applied for permission to legalize the occupancy as a multiple dwelling (noting that it had been occupied as fifteen studio apartments “at least since the present applicant purchased the subject property”) and to convert it into nine apartments. He subsequently modified the project and in October of 1994, he filed for (and subsequently received) permission to convert the property into six apartments. On June 5, 2002, 435 Marlborough was purchased from Charles Patsos by the Prospect One Realty LLC. On April 30, 2003, Peter A. Bailey, who was manager of record of Prospect One Realty LLC, acquired the property as trustee of the 435 Marlborough Realty Trust. On June 1, 2004, 435 Marlborough was purchased from Peter Bailey by Matthew C. Bailey, trustee of the 435 Marlborough Street Realty Trust. 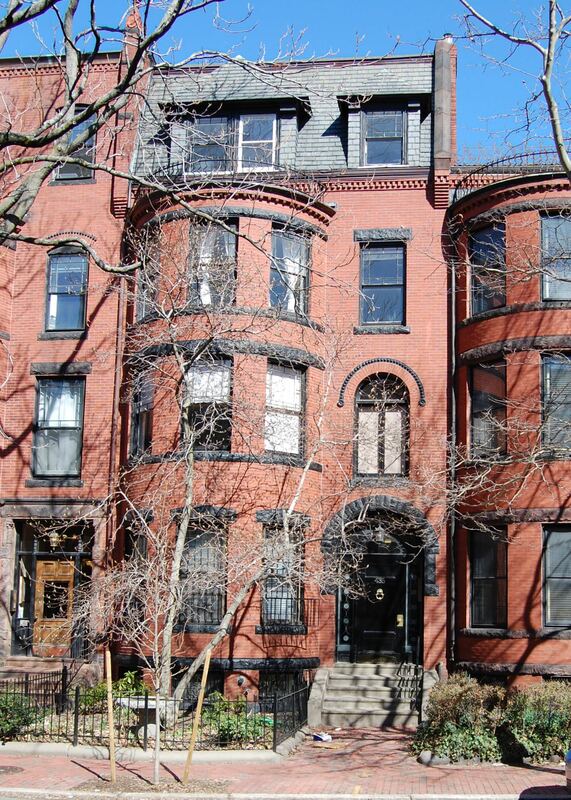 On August 31, 2004, he converted the property into six condominium units, the 435 Marlborough Street Condominium.